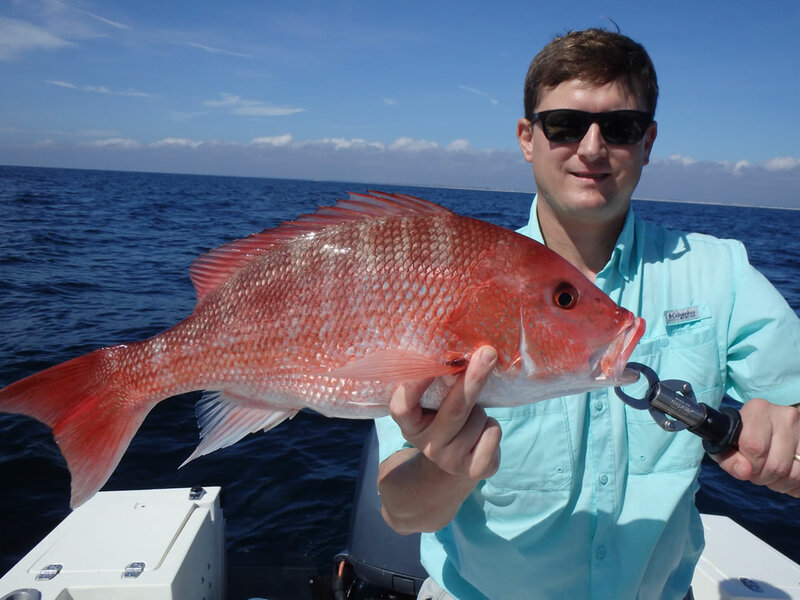 Fall 2018 began with clear water, cooling temperatures, and everything looking good until Hurricane Michael arrived the second week of October. Even though the storm missed us by 100 miles the resulting rain and fresh water runoff affected the habits of our normal fall species. 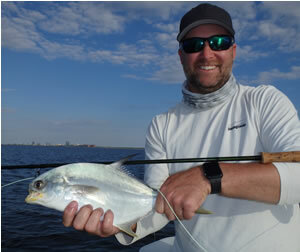 We had some great days with redfish, jack crevalle, and Spanish mackerel, but the season as a whole was below par. 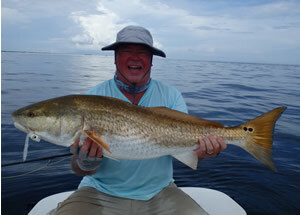 That said we worked hard when conditions allowed us to fish, and many clients had outstanding trips. Check out these photos from the fall season. Double-click the thumbnails for full-page photos. For photos from previous seasons follow the links to these additional galleries:Summer 2018, Spring 2018, Fall 2017, Summer 2017, Winter and Spring 2017, Fall 2016, Summer 2016, Winter and Spring 2016 , Fall 2015, Summer 2015, Spring 2015, Winter 2015, Fall 2014, Summer 2014, Spring 2014, Winter 2014, :Fall 2013, Summer 2013, Spring 2013, Winter 2013, Fall 2012, Spring 2012, Winter 2012, Fall 2011, Summer 2011, Spring 2011, Winter 2011, Fall 2010, Summer 2010, Spring 2010, Winter 2010, Fall 2009,Summer 2009, Spring 2009, Winter 2009, Fall 2008, Summer 2008, Spring 2008, Winter 2008, Fall 2007, Summer 2007, Spring 2007, Winter 2007, Fall 2006, Summer 2006, Spring 2006, Winter 2006, Spring 2005, Summer 2005, Fall 2005. Use the back button on your browser to return to this page. 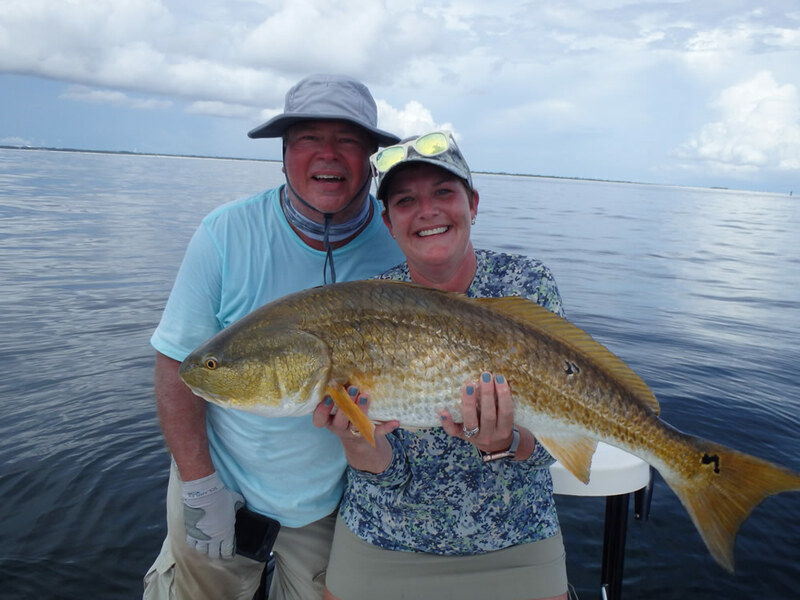 We started off the day September 28 sight-fishing for redfish on the shallow flats of Santa Rosa Sound. Mike and Stephanie Kusch, Murfreesboro, TN, were on board. 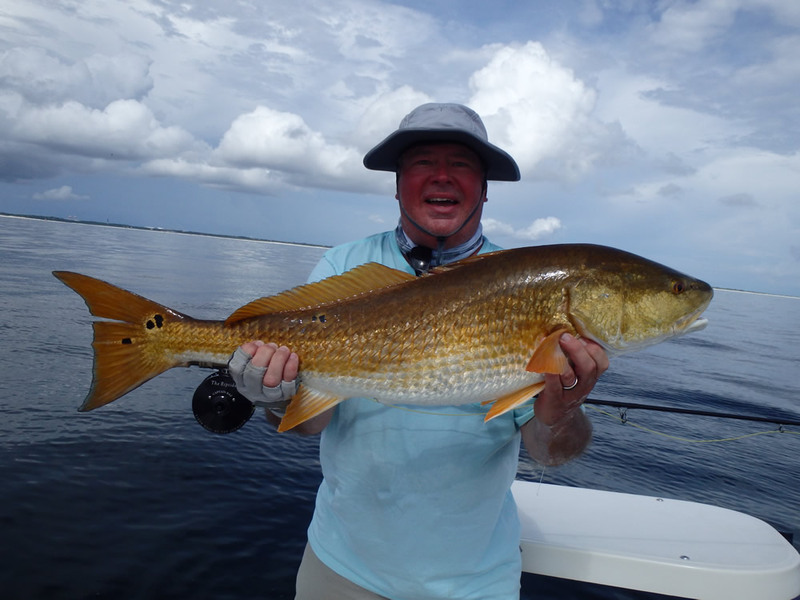 It was a tough morning with thunderstorms in the area and off-and-on sun, but Mike coaxed this redfish to eat his tan/white clouser minnow. 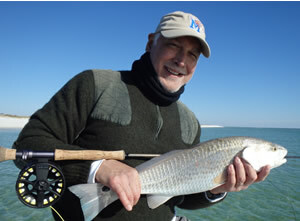 Beautiful silvery-tan fish with a nice blue tail...Mike's first redfish on fly. 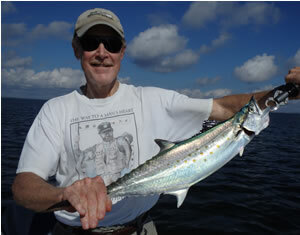 Later in the afternoon we hit the jackpot at the sunken battleship USS Massachusetts 1.3 miles out from Pensacola Pass. 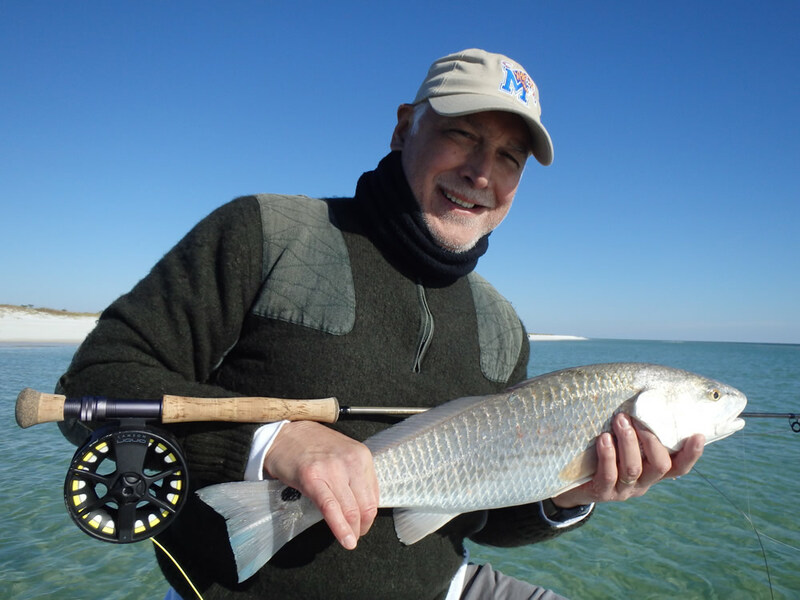 The Gulf of Mexico was glassy-calm, and as we pulled close to the wreck we could see a school of bull redfish chasing baitfish on the surface. 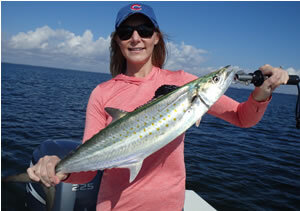 Stephanie hooked up immediately on light-tackle as we frantically got out the 10wt for Mike. After a ten minute fight she brought this fish to the net. What a photo! 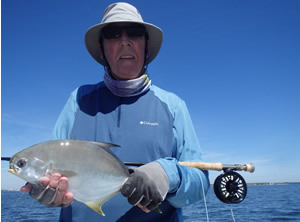 "A picture is worth 1000 words"
Mike cast the big popper numerous times into the school with fish after fish striking at but missing the fly. 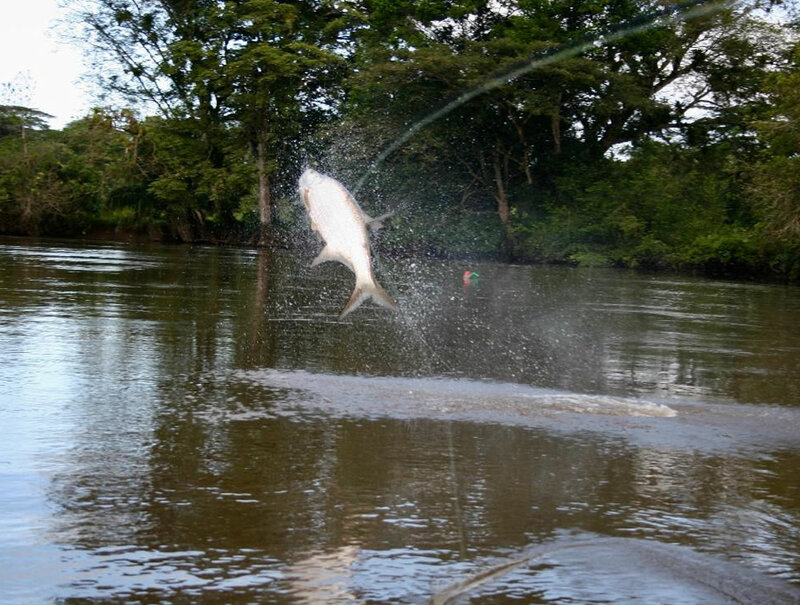 The surge from the charging fish would push the fly out of the way just as the fish struck. It was exciting but maddening until this beauty finally got the hook. Now THAT's how you spell r-e-l-i-e-f. 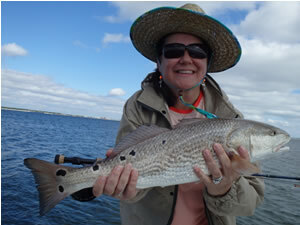 Terrific shot of Stephanie with another gorgeous redfish. Looks like the perfect holiday greeting card...Awww. And here's Mike sitting on the poling platform showing off that big white popper tied by Ben Walters, Eastern Fly Outfitters. 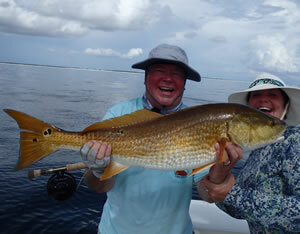 The Sage ONE 10wt and Tibor Riptide were a perfect match for these big fish. What a treat! We were the only boat out there. 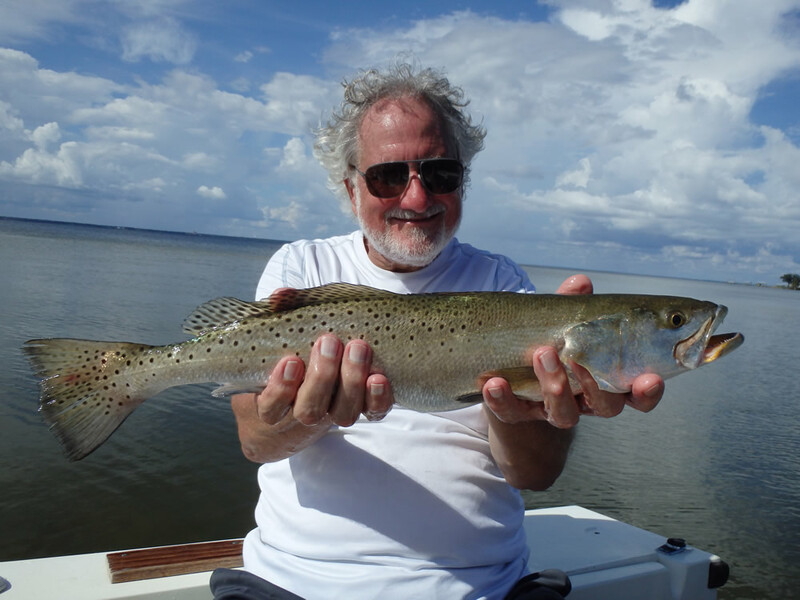 Snead Finch from Winston Salem, NC, with a Butcherpen Cove speckled trout on October 1. 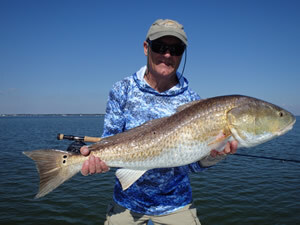 A little later when the jacks showed up Snead grabbed the big spinning rod and made a perfect cast with a 5" topwater "chug bug". This fish crushed it and was off to the races for about 20 minutes. When the fish was finally whipped Snead got out of the boat to resuscitate it. 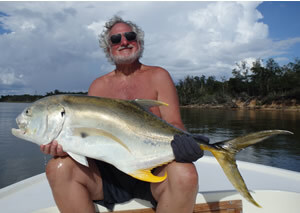 Double click for a nice shot of Big Snead and Jack Crevalle in a couple feet of water. 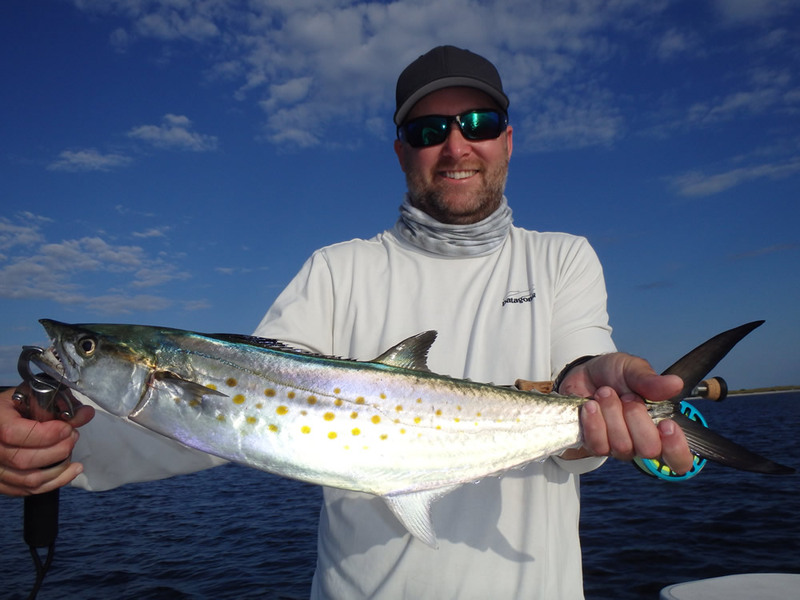 Brad Yeager was in town October 4, and we headed straight for the Spanish mackerel feeding grounds. 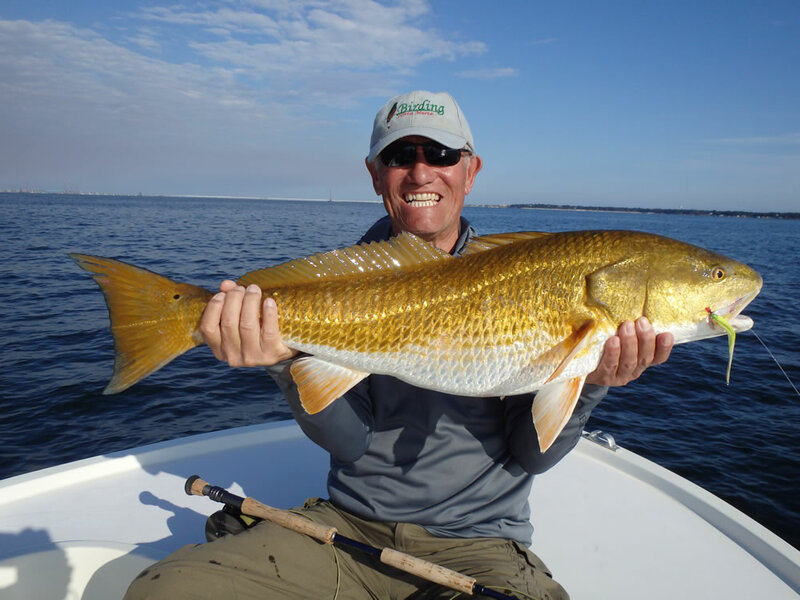 During October the biggest Spanish of the year feed on Santa Rosa Sound grass beds in 5-7' of water. 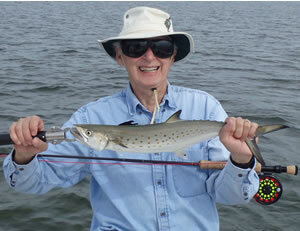 We blind-cast for them using 8wt tackle and clouser minnows, other streamers, and poppers. 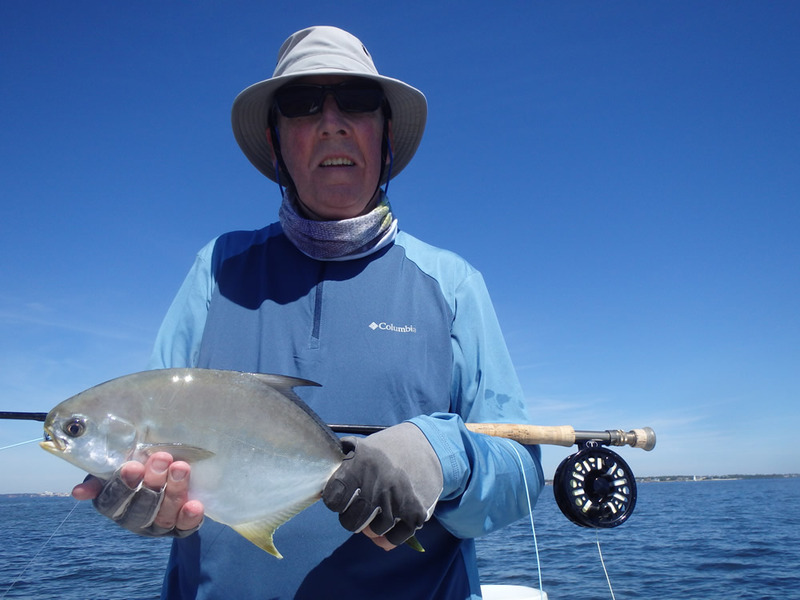 The fish weigh up to 9# (30 inches to the fork) and will bite through 60# tippet, so we use either 80# mono or 26# seven-strand nylon-coated wire. 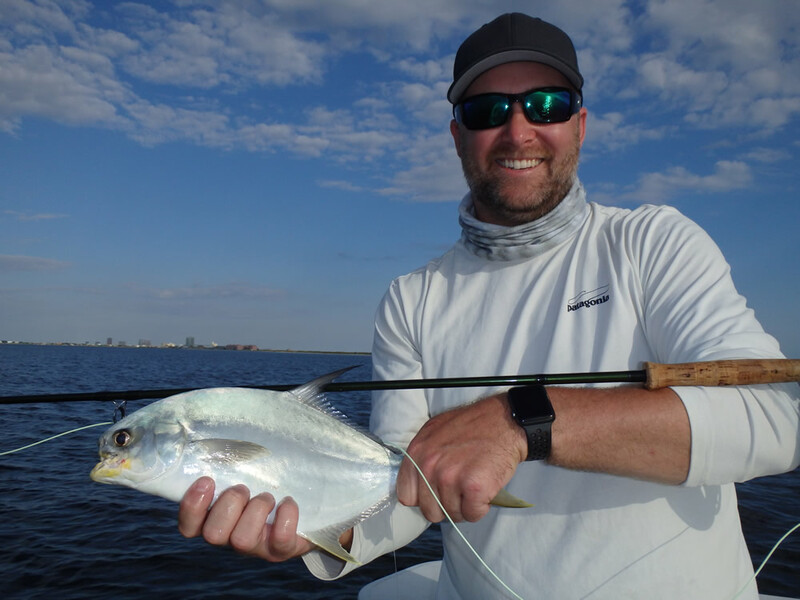 It's surprising that usually leader-shy pompano feed on those same grass beds in October, and we catch them while Spanish mackerel fishing heavy leaders and all. Here's Brad with the first fish of the day. Pretty darn nice bycatch! 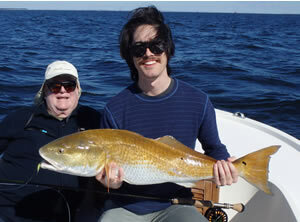 Brad with a typical-sized Spanish. 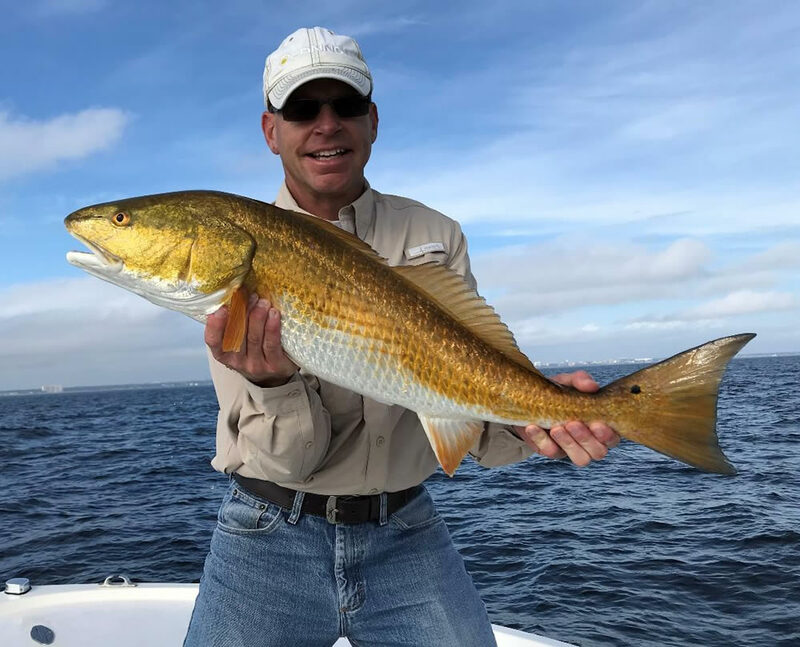 This fish is in the 4-5# range. Imagine an 8 pounder! They are as fast as any fish you'll ever hook on an 8wt and are more that happy to leave you with line burns and busted knuckles. Andrew Anderson from Scotland with the first fish of the day on a cool October 12 morning. 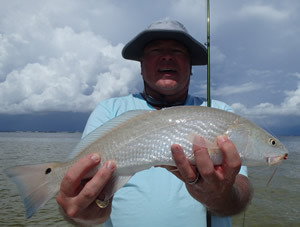 Pretty little redfish on a tan clouser. 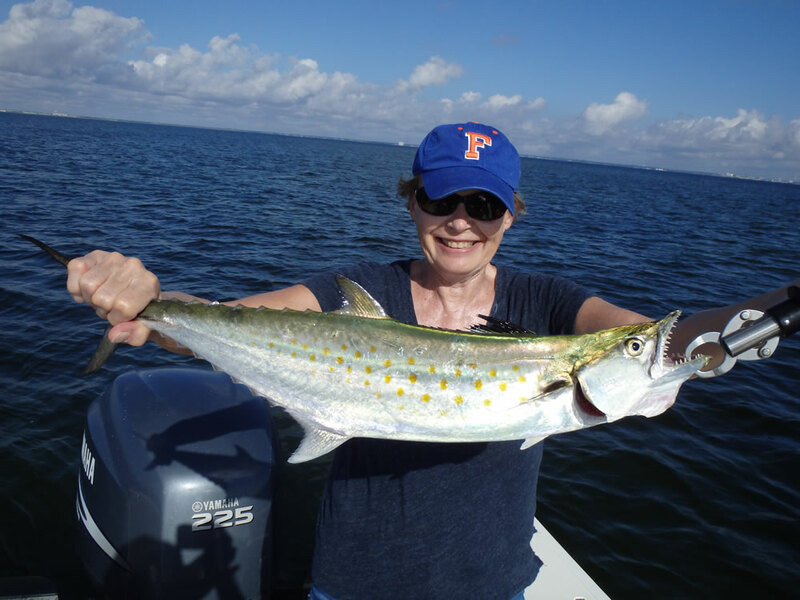 The Spanish mackerel returned in spades the following week on October 15 for the Marsh family. 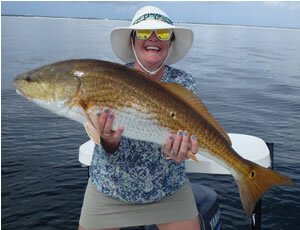 Dawn tied for "biggest fish of the day" with this 6#+ Spanish. Double click for a close up of the teeth on this fish. Easy to see why wire or 80# mono leaders are necessary. Tim Marsh with a 4-5 pounder headed for the cooler. 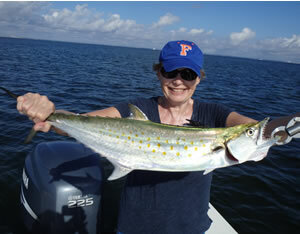 Spanish mackerel are excellent table fare as long as you take extra care to not let the meat spoil. If we are keeping them we immediately submerge the whole fish in ice and keep it there until it's cleaning time. We skin and de-bone the fillets taking extra care to remove all the red meat along the lateral line. You're left with four white-meat, boneless fillets per fish that go right back on the ice until they're cooked. Highly recommended to eat them either immediately (Pegleg Pete's will fry, cajun-fry, blacken, or grill them for you) or for sure that night at home. Here's Ellen with the other monster Spanish of the day. Tied with her mom. Nice work, ladies! Check out the girth on that fish. 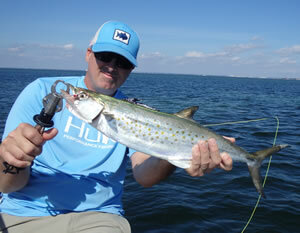 Mitch Waite was back in town the following day for the hot Spanish mackerel action. 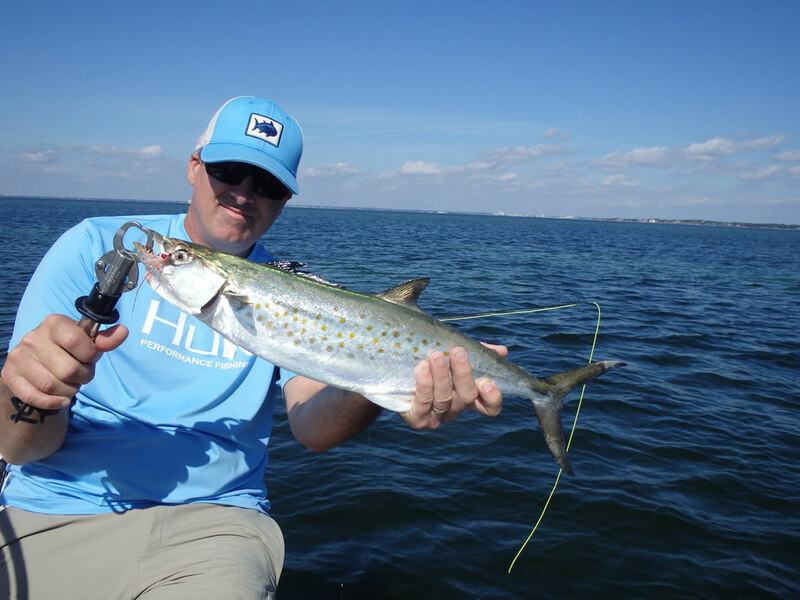 Mitch likes to catch these fish on topwater plugs, and who could blame him. 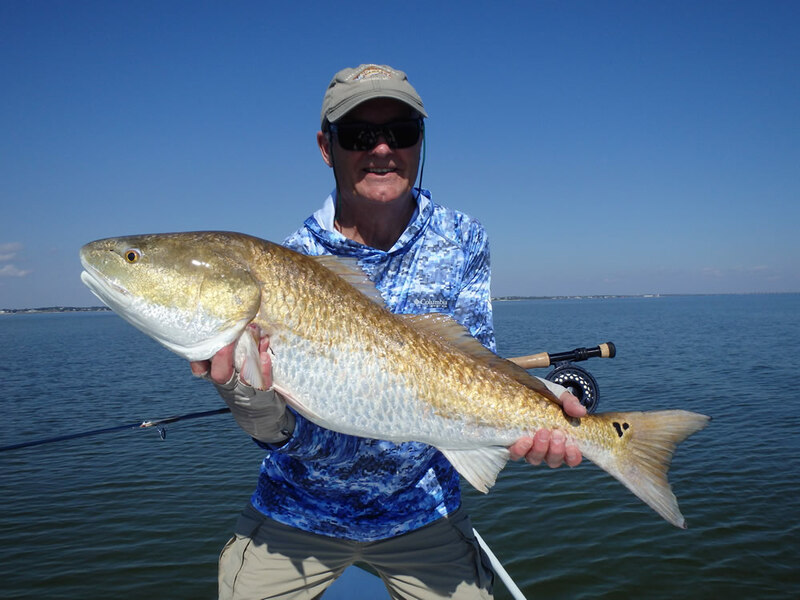 Sounds like a depth charge going off when one of these brutes crushes a topwater "chug bug"! 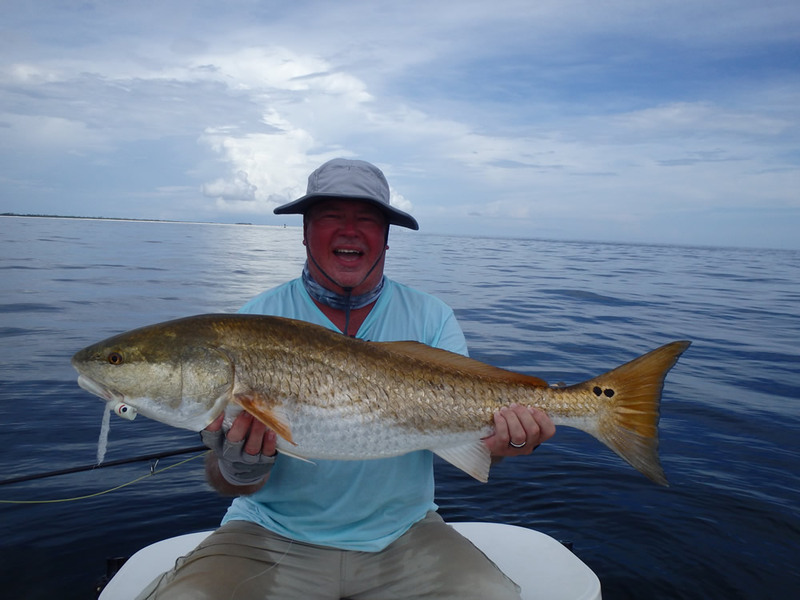 John Boles and Jim Himmelwright were here for two days starting October 17 hoping for the big Spanish, but the fish were gone. The rains from Hurricane Michael the previous week flooded the rivers feeding into Pensacola Bay. 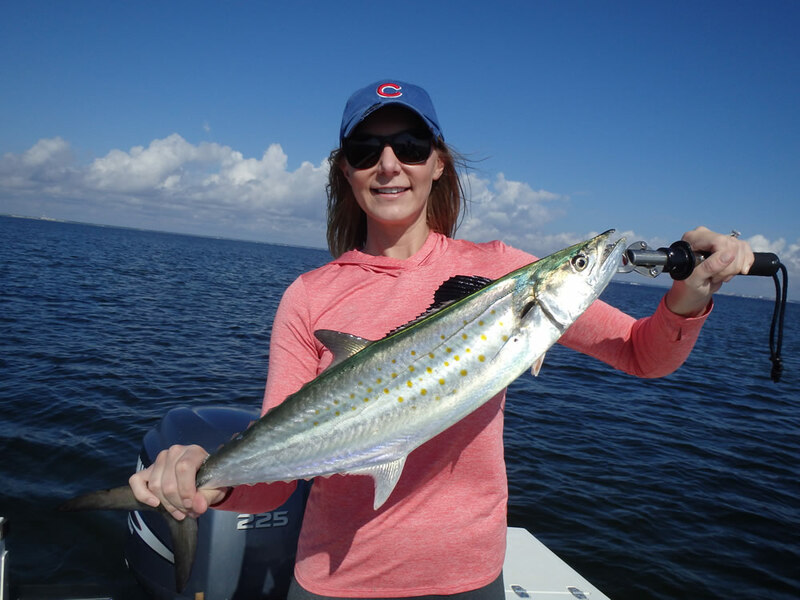 It takes a few days for this lower-salinity sediment-filled runoff to reach the waters where we fish, but when it does the Spanish mackerel depart for the higher salinity in the Gulf. They will return when the salinity in the inland waters returns to normal...usually a couple weeks. 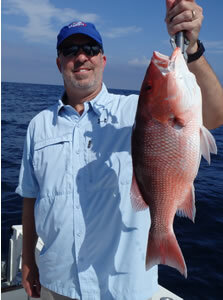 We decided to run 7 miles offshore and have fun catching and releasing red snappers on live pinfish. This is John Boles, and he seems to be giving me a middle-finger salute... Thank you, John. He was happy, however, when the mahi-mahi showed up, and he and Jimmy caught enough for dinner. 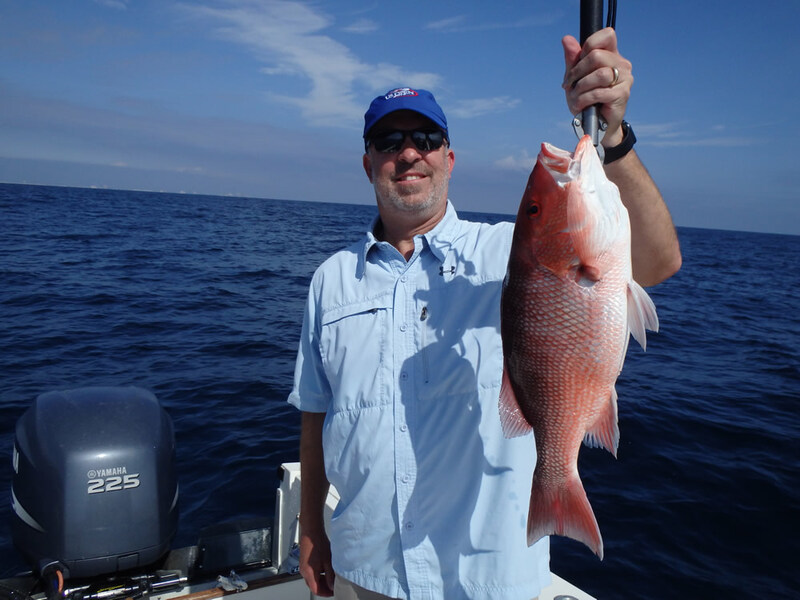 Jim Himmelwright on October 17 with another nice red snapper caught on spinning tackle and released. 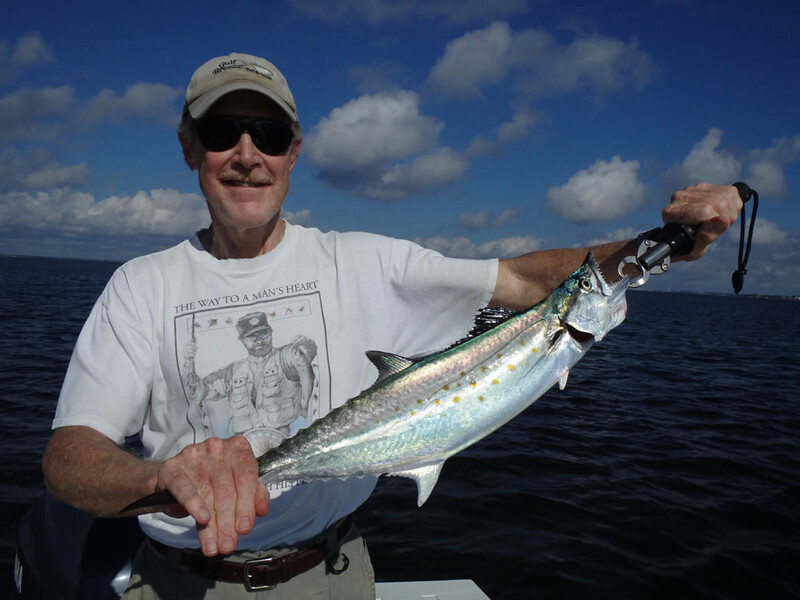 In addition to catching mahi-mahi for dinner, Jim and John had a ton of fun with some 6-8# false albacore that showed up at the wreck. 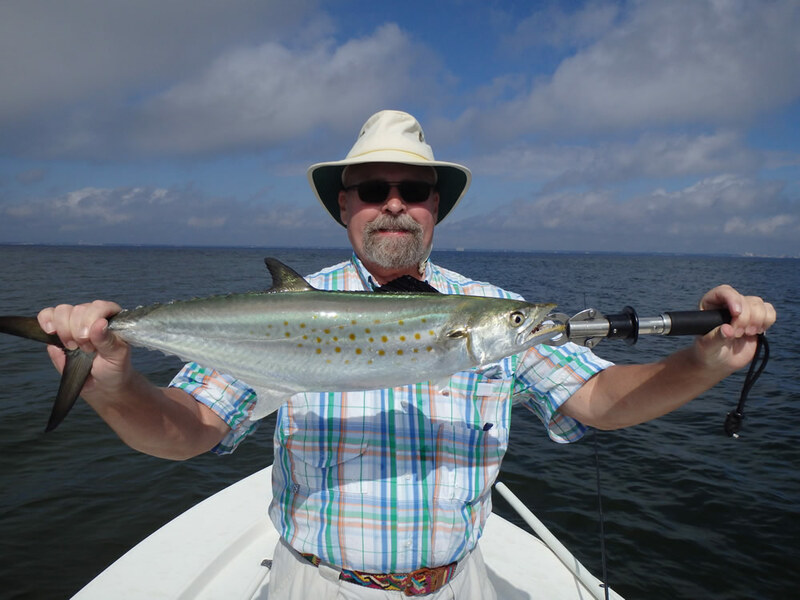 The following day we once again tried one of our favorite Spanish mackerel spots, and Jimmy caught the fish of the week. 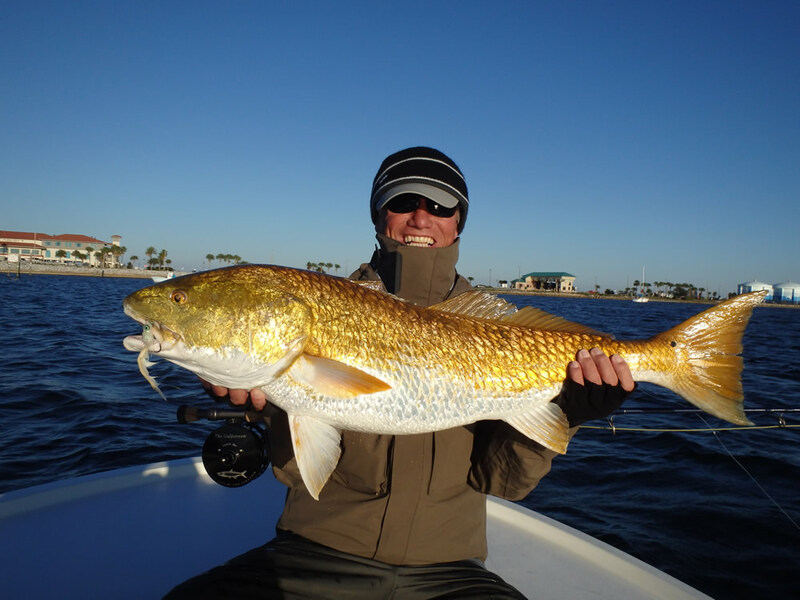 What a surprise to have this monster redfish take his spoon in 5' of water! 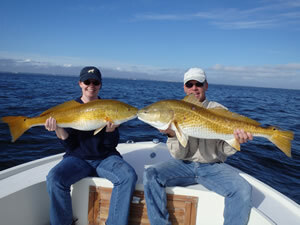 That's a lot of redfish on light tackle. There were three boats/guides that week, and this is the best fish landed on mine. 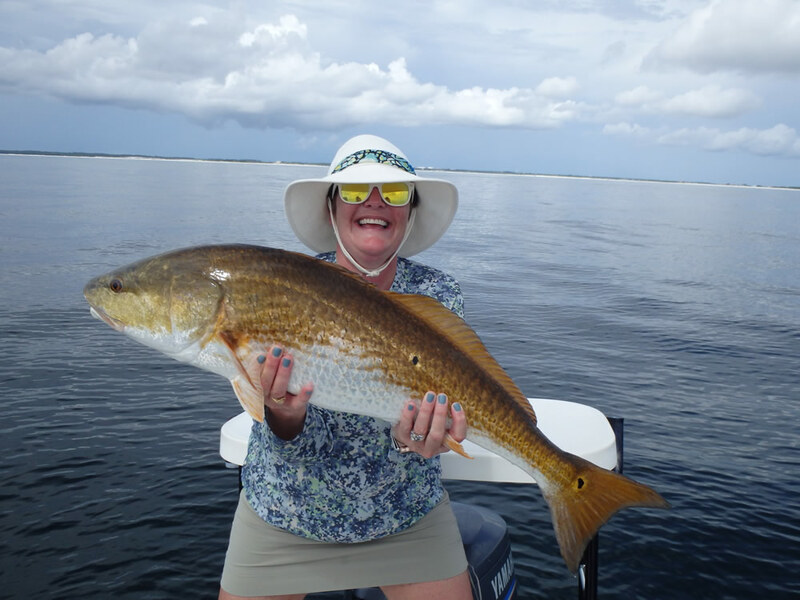 Sandy Carpenter on October 26 with a very nice redfish landed at the Ft McRee rock jetty. On outgoing water a counter-clockwise eddy forms on the south side of the jetty, and the fish sometimes hold there waiting to ambush baitfish that are being swept out with the current. We anchored close to shore just south of the jetty, and Sandy using a full-sinking line worked the fly through the swirling currents. It was expert-level fly-fishing, and she handled it beautifully. 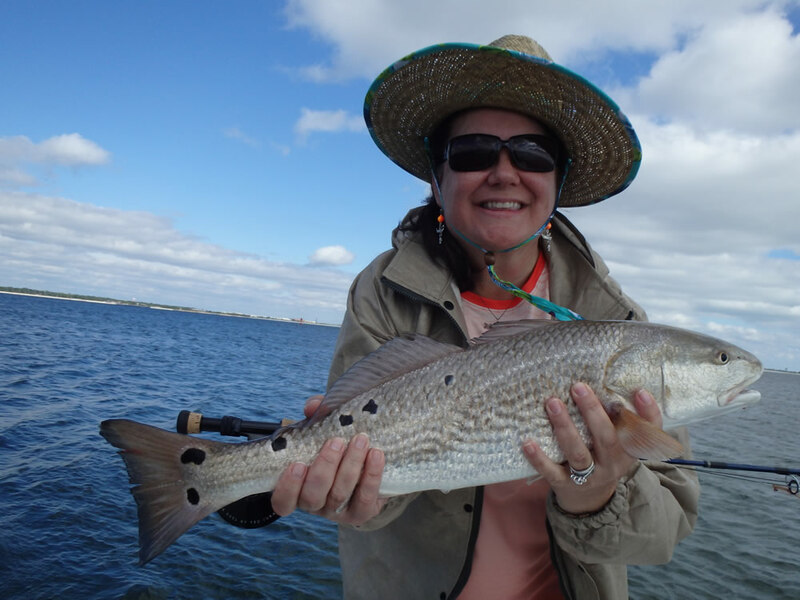 Her scream when this fish followed and refused the fly was priceless, and it got even better on the next cast when the redfish nailed it. Good job, Sandy! 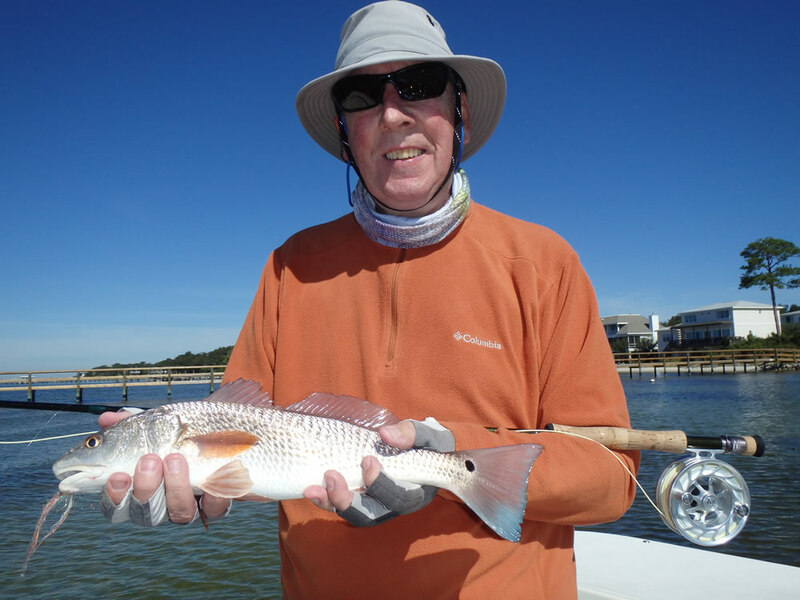 We spent the morning of October 29 poling the flats with Steve Deeg throwing various flies at very spooky redfish. We saw plenty of fish but couldn't get one interested in the fly. 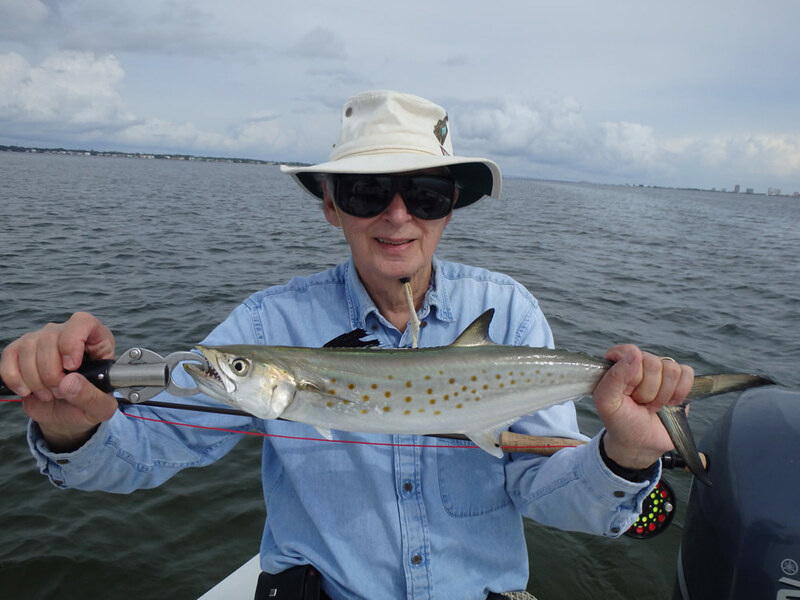 After lunch we shifted gears and tried the outside edge of one of our favorite Spanish mackerel grass beds hoping for a wayward Spanish or possibly a pompano. 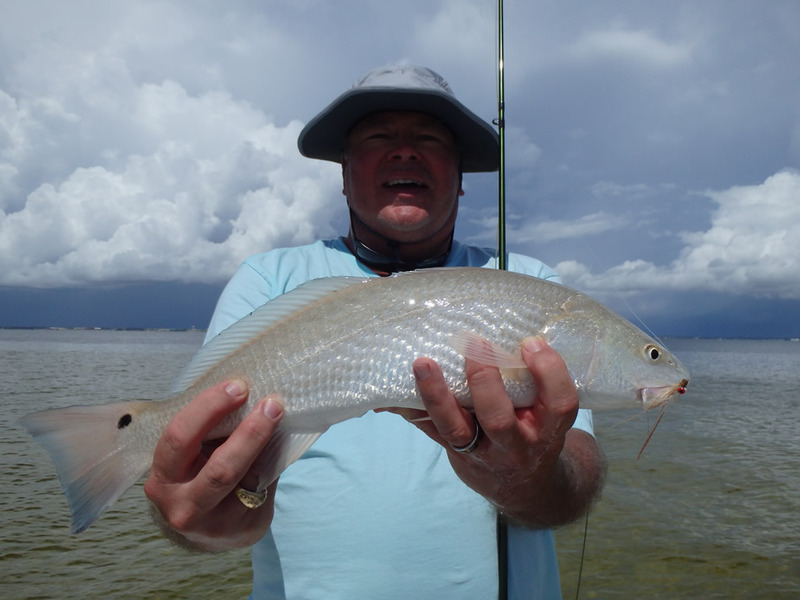 We anchored on the sand in about 6' of water, and Steve blind-cast a clouser minnow onto the grass stripping it back across the edge. Water was clear, and we saw a big fish swim under the boat right on the bottom. 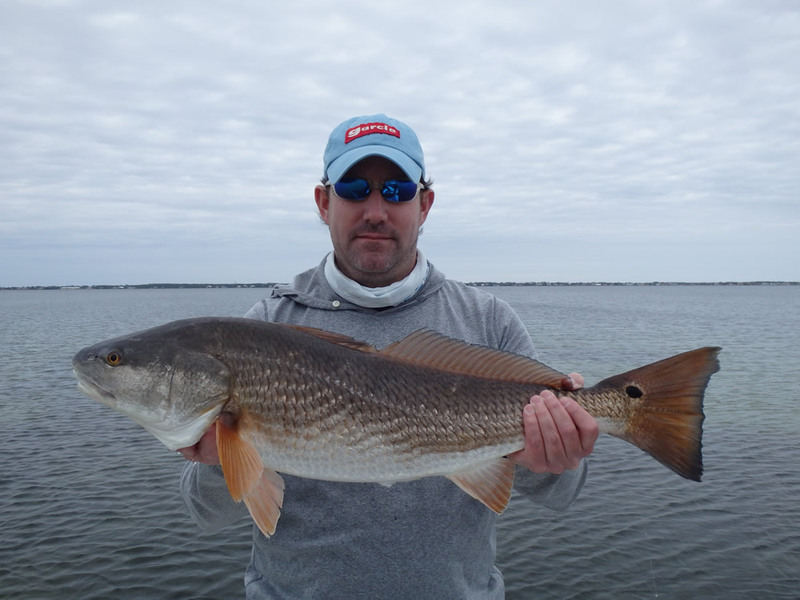 After a while we saw another one, and it sure looked like a big redfish. Steve pulled out the 8wt with full-sinking line, 3' leader, and a heavy tan/white clouser...and waited. 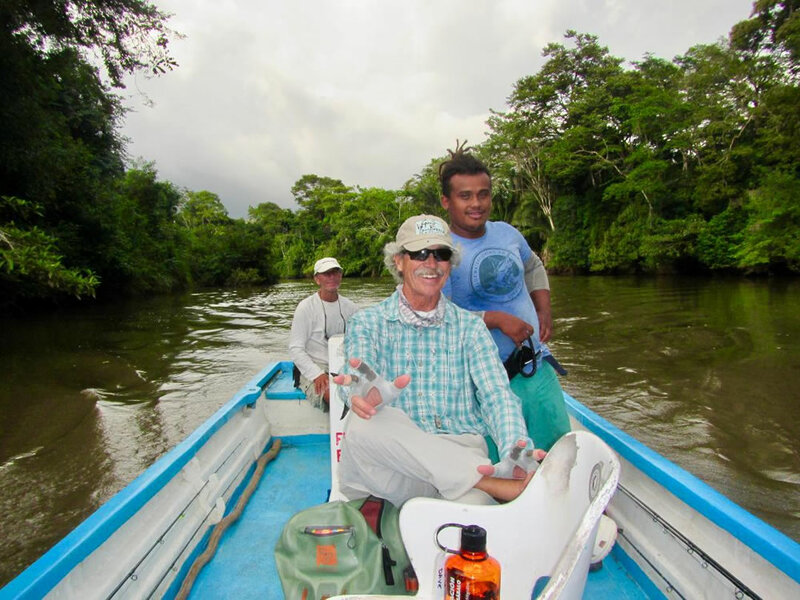 It wasn't long before we saw another big fish easing along the bottom 20' from the boat, and Steve put the fly out in front of the fish and let it sink. One strip and this fish inhaled it! Twenty minutes later he landed this beauty. Was it a fluke, or were we on to something?? 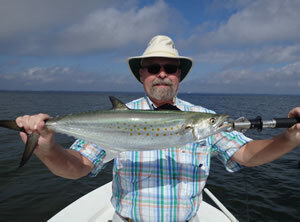 Brian Freeman was on a Project Healing Waters trip October 31 and landed this fine Spanish mackerel on his 8wt. The annual "Running of the Bulls" started this year on November 3, and Brian Iwasaki and his grandfather Russ Shields were on the boat to experience it. Talk about good timing! 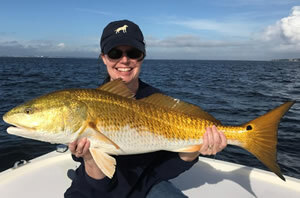 Every year thousands of brightly-colored bull redfish move into Pensacola Bay searching for millions of menhaden that are migrating to the Gulf. It's quite a sight when the two collide, and the redfish push the menhaden to the surface crushing them on top. Of course hundreds of pelicans are diving into the melee from above creating a bona fide "feeding frenzy". 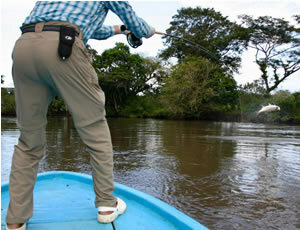 As you can imagine it's an exciting place to be standing with a fly rod in your hand. Everybody wins except the menhaden... 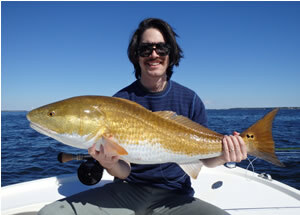 Here's a terrific "magazine-cover quality" shot of Brian with his first redfish. 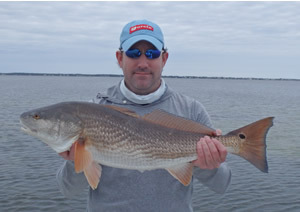 Brian with another impressive redfish. We asked Russ to slide in there for the family photo. 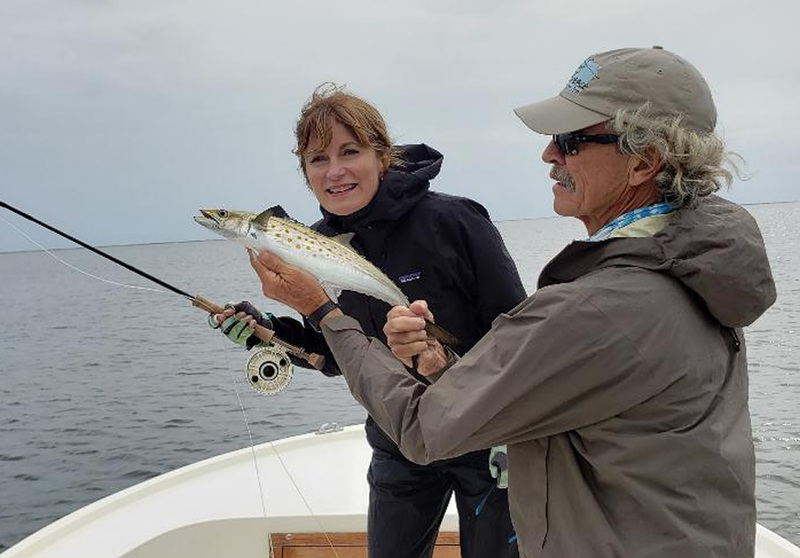 Rebecca and Bob Maindelle were visiting from Salado, Texas, on November 5 hoping for lots of Spanish mackerel action, but it wasn't to be. 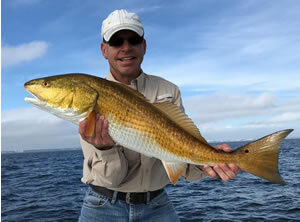 Most of the Spanish left after the storm, and the only game in town was redfish. 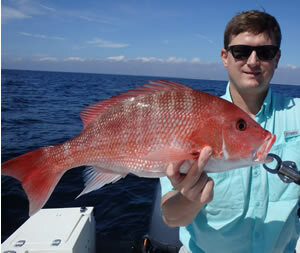 The schools of fish weren't plentiful, but when we found them the quality was top notch. 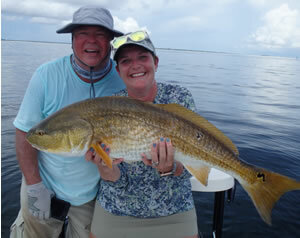 Rebecca and Bob shown here with a bull redfish "double". 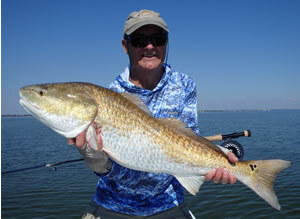 Bob guides in Texas, and you can find him here. 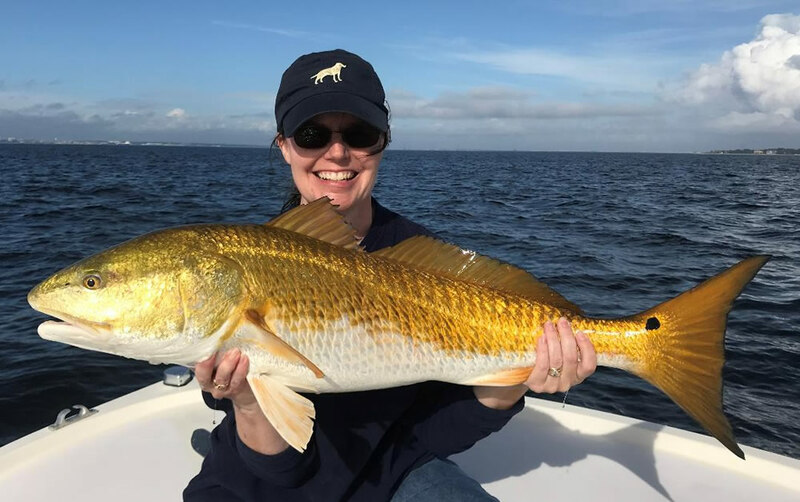 Rebecca Maindelle looking great with a picture-perfect redfish. 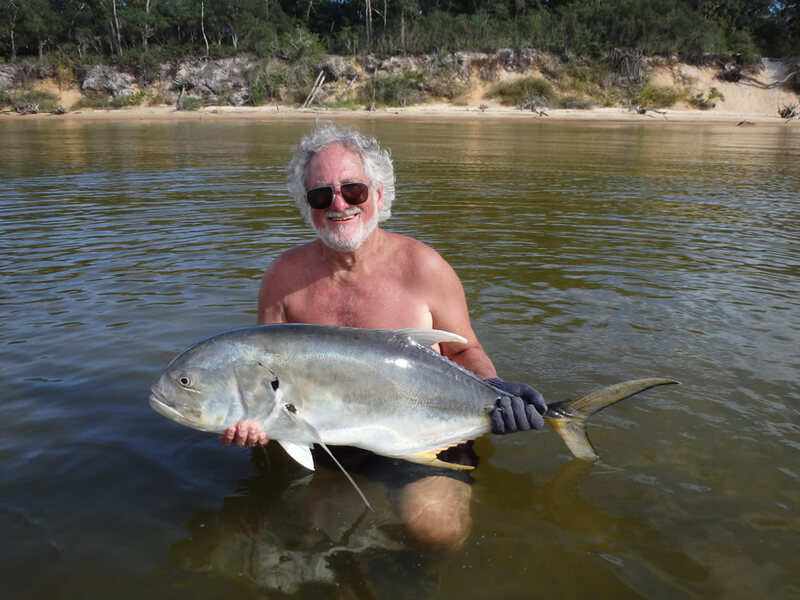 Bob Maindelle in a stylish pose with his second fish. Guides always know how to hold the fish! Looking good, Bob. How about that! 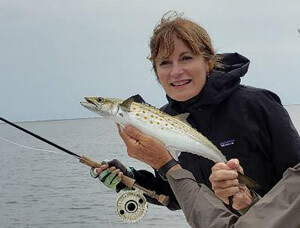 Good friend Joe Rosenbaum with the last Spanish mackerel of the year on November 9. Who said all the Spanish were gone?! 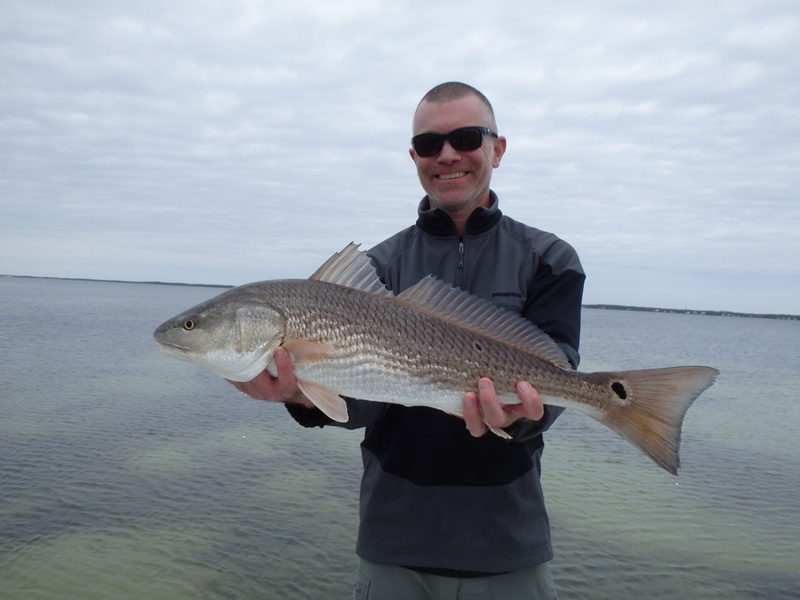 Mike Youkee in town from London for a week of redfish hunting. 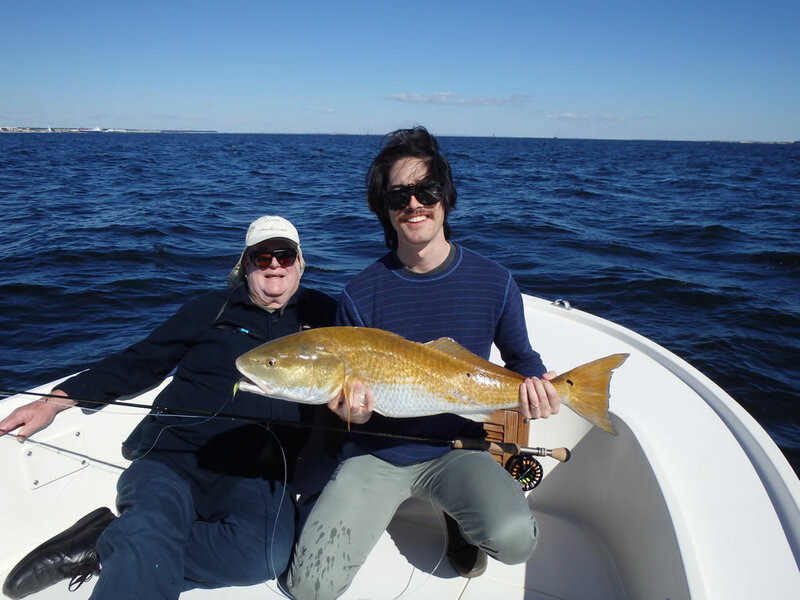 Beautiful fish on a beautiful November 11. Nice work, Mike. Conditions changed considerably the next couple days with the passing of a cold front. 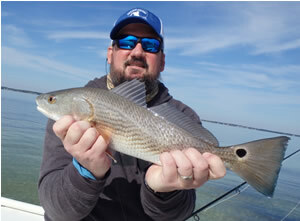 Crisp, cool air and sunshine always gets the redfish turned on. 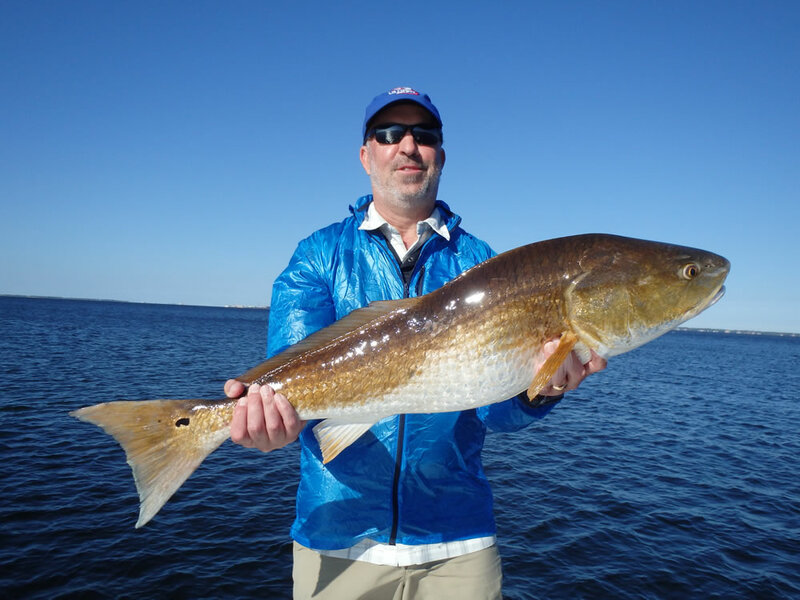 That's a white rabbit-strip streamer hanging out of the redfish's mouth, and look at the belly on that fish! 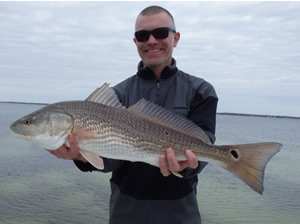 Rich Playford with the last fly-caught inside flats redfish of the season. Not a big fish but a very satisfying catch. 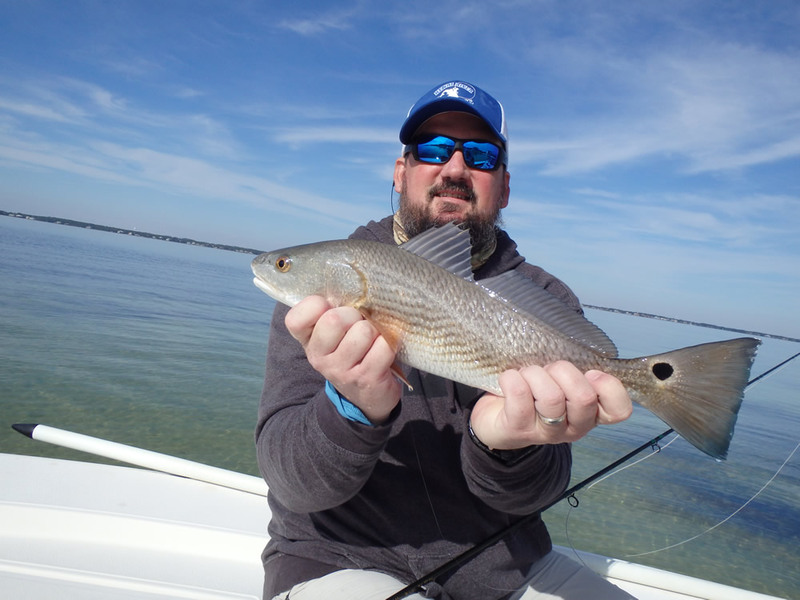 Fishing buddies Alan Dew and Bryan Miller were on the boat November 29 for a day of light-tackle redfish sight-fishing. We had off-and-on light, but the fish were big enough to see even in the worst conditions. Here's Alan with a 7 pounder landed and released unharmed. 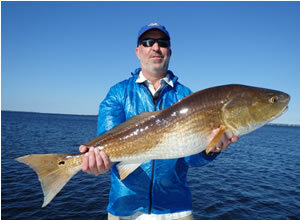 The photo of this redfish doesn't do it justice. 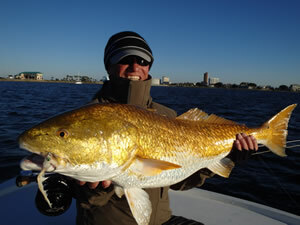 The fish weighed 12 pounds on the bogagrip... a heckuva redfish coming from 2' of water. Bryan did a great job bringing it to the net and releasing it unharmed. 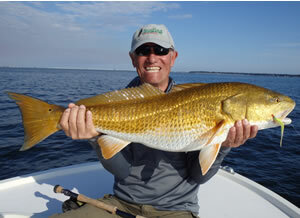 Carlos Cantu with the last redfish of the year on December 5. The Gulf of Mexico was as pretty as it gets, and we poled the beach until we found a school of about 30 redfish of all sizes. We anchored the skiff just out of range and waited for the fish to come into range. It took two fly changes, but the chartreuse/white half and half did the trick. 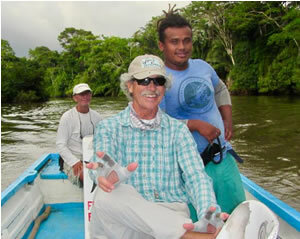 Three days later fishing the Rio Frio in Costa Rica for giant tarpon. In this photo I am trying to get my 1/0 EP baitfish under those limbs to a spot against the bank where we'd seen a big fish roll. After about 30 tries I finally landed the fly in the right position for a perfect drift. All hell broke loose when the hundred pounder ate the fly and became airborne. Double-click for a nice photo taken by Dave McLeod. 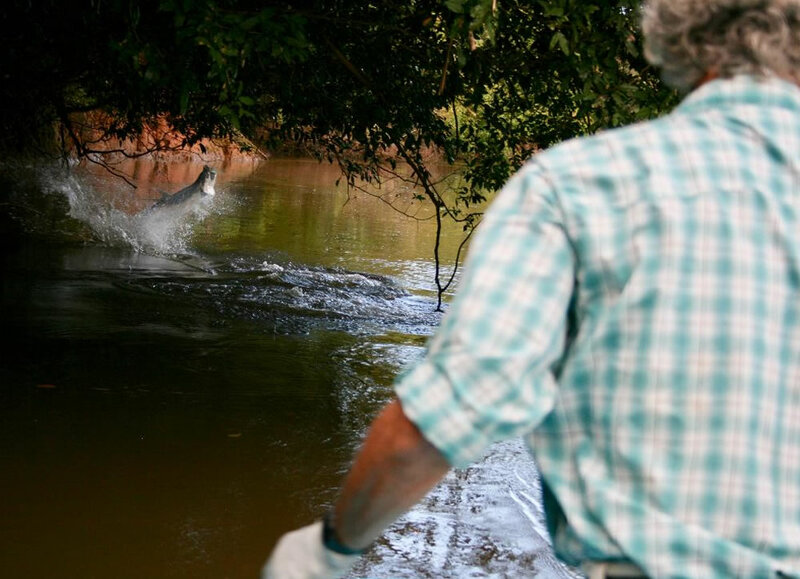 Bowing the 12wt to another tarpon before it threw the hook and took off downstream... Double-click for another look at this magnificent fish. Photos by Dave McLeod. 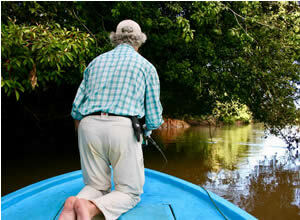 Adios to everyone from Costa Rica's "Jungle Tarpon Reserve". 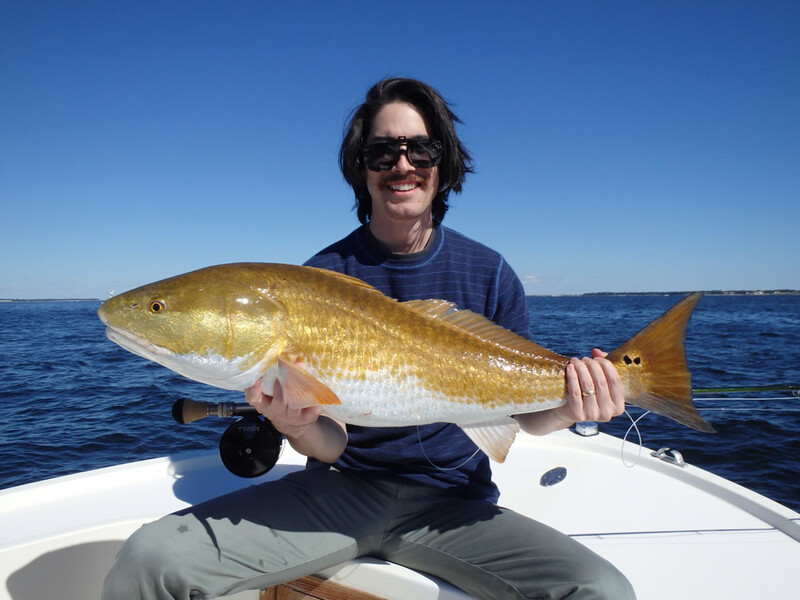 Thanks for coming to Gulf Breeze to fish with me. Let's drink to health and happiness in 2019, and let the good times roll!